Not to be confused with John Ryan. Jonathan Robert Ryan (born November 26, 1981) is a Canadian-born American football punter who is currently a free agent. He played college football for the University of Regina Rams, and began his professional career with the Winnipeg Blue Bombers of the Canadian Football League (CFL) after being selected in the Canadian College Draft. He's also played for the Green Bay Packers and was a member of the Seattle Seahawks for ten seasons. Ryan was born and raised in Regina, Saskatchewan. On Halloween when he was 8 years old, he dressed up as a punter. He attended Sheldon-Williams Collegiate for high school, where he played as running back, placekicker and punter on the school's football team. He then attended the University of Regina, where he played both punter and wide receiver for the Regina Rams football team from 2000-2003. During his sophomore season with the Rams, he caught a 109-yard touchdown pass, and led the team in receiving, in addition to his kicking duties. After his fourth year with the Rams, Ryan picked up several team awards, including Best Special Teams Player, Top Scorer and Most Valuable Player. He was also named a first team Canada West All-Star, and a CIS All-Star. Ryan also ran track for the University of Regina. In 2004, the Winnipeg Blue Bombers of the Canadian Football League (CFL) selected Ryan as a punter and wide receiver in the third round of Canadian College Draft, making him the 24th overall pick. Ryan joined the Blue Bombers for the 2004 CFL Season. During his rookie season, Ryan finished second in punting average to Noel Prefontaine of the Toronto Argonauts. During the 2005 season, Ryan led the league with a 50.6 yard average, while punting the most out of all league punters, 118 times. NFL talk buzzed around Ryan's future, while midway through the year, there was also speculation that Ryan may take over the kicking duties as well from aging veteran Troy Westwood. On February 7, 2006, Ryan signed with the Green Bay Packers to a three-year $965,000 contract. He was only the third Saskatchewan native to make it to the NFL, following Arnie Weinmeister and Rueben Mayes. During training camp in 2006 he found out his father, Bob, was diagnosed with terminal cancer and he persevered through a tough season, which included punting in a game two days after his father's death. His teammates voted him as the recipient of the Ed Block Courage Award in 2006 for his display of courage and sportsmanship, and for being an inspiration in the locker room. On September 10, he made his NFL debut against the Chicago Bears. In the 26–0 loss, he finished with six punts for 270 net yards for a 45.00 average. Overall, in the 2006 season, he finished with 84 punts for 3,739 net yards for a 44.51 average. On September 30, 2007 against the Minnesota Vikings he became the first Packers punter to rush for a first down since David Beverly did so against the Houston Oilers on December 14, 1980. His rush attempt that resulted in a gain of 7 yards came on a fake punt that was originally intended to be a pass, however, he did not hear the coaches call it off at the last minute. He ran with the ball when he realized he had no one to throw to and ran into several of his blockers in the process because they did not know he was running with the ball. On December 23, 2007, Ryan had two of his punts blocked by the Chicago Bears, including one that was returned for a touchdown. He also had a nine-yard punt during the game and bobbled a snap on another that lead to a turnover on downs. Before this, the Packers went 929 punts without a blocked punt, dating back to September 11, 1995. On December 30, 2007 during a 34-13 victory over the Detroit Lions, Ryan kicked a 72-yard punt in the fourth quarter, the longest punt at Lambeau Field since Don Chandler's 90 yard punt in 1965. The punt tied for the second longest in franchise history - set by Sean Landeta September 20, 1998 at Cincinnati. During the 2007 season, Ryan posted a net average of 37.6 yards, 12th in the NFL and the finest in Green Bay since 1969. His gross mark of 44.4 was the fourth-best in club history. Ryan was released by the Packers on September 1, 2008. Following Week 1 of the 2008 regular season, Ryan signed with the Seattle Seahawks on September 9 to a two-year $980,000 contract. In Week 8 against the San Francisco 49ers, he hit a 63 yd punt, a 60 yd punt and a 55 yd punt. He finished the 2008 season with 78 punts averaging 45.6 yards. In his Week 6 game of the 2009 NFL season, he threw a 42-yard pass against the Arizona Cardinals to garner a 118.7 QB rating for the season. Overall, in the 2009 season, he finished with 88 punts for 4,068 net yards for a 46.23 average. After the season ended, Ryan signed a six-year, $9.1 million contract with $1.9 million guaranteed and $1.6 million in signing bonus. He was also named a Pro Bowl alternate following the 2009 season. On October 17, in a game against the Chicago Bears, Ryan was hit by Earl Bennett while trying to make a tackle on Devin Hester's 89-yard punt return for a touchdown. Ryan's ribs were injured, but not fractured. Ryan played in the final game of the 2010 regular season against the St. Louis Rams and landed a punt on the two-yard line on the fly towards the end of the first quarter. Later, in the fourth quarter, he pinned the Rams inside of their own 10-yard line again, this time kicking it down to the seven-yard line. His efforts helped the Seahawks secure the final playoff spot remaining in the 2010 NFL season. This marked the first time that a team with a losing record (7–9) has made the NFL playoffs as a Division Champion (NFC West). Overall, in the 2010 season, he finished with 78 punts for 3,254 net yards for a 41.72 average. Overall, in the 2011 season, Ryan finished with 95 punts for 4,391 net yards for a 46.22 average. Overall, in the 2012 season, Ryan finished with 65 punts for 2,963 net yards for a 45.58 average. In the 2013 season, Ryan finished with 74 punts for 3,159 net yards for a 42.69 average. On February 2, 2014, Ryan became the first player from Saskatchewan to win the Super Bowl when the Seahawks defeated the Denver Broncos 43–8 in Super Bowl XLVIII. In the 2014 season, Ryan finished with 61 punts for 2,688 net yards for a 44.07 average. In the third quarter of the NFC Championship Game, in which the Seahawks were trailing 16–0, Ryan threw a 19-yard touchdown pass to Garry Gilliam on a fake field goal. He is the first punter to throw a touchdown pass in an NFL playoff game and the first Canadian to do so since quarterback Mark Rypien in 1993. The Seahawks ultimately won the NFC Championship by a score of 28–22 and advanced to their second straight Super Bowl. In Super Bowl XLIX, Ryan finished with six punts for 269 net yards for a 42.33 average. In the 2015 season, Ryan finished with 68 punts for 3,105 net yards for a 45.66 average. On March 11, 2016, he signed a four-year $10 million contract to stay with the Seattle Seahawks. In Week 15, against the Los Angeles Rams, Ryan rushed for 26 yards and a first down on a fake play but was injured on the play. Overall, in the 2016 season, he finished with 71 punts for 3,126 net yards for a 44.03 average. Overall, in the 2017 season, Ryan finished with 92 punts for 4,141 net yards for a 45.01 average. On August 20, 2018, Ryan was released by the Seahawks after 10 seasons with the team. At the time of his departure Ryan was the longest-tenured Seahawk on the current roster. On August 21, 2018, Ryan signed with the Buffalo Bills. He was released on September 1, 2018. Ryan is married to stand-up comedian Sarah Colonna and has appeared on her podcast Off The Rails, with Josh Wolf, numerous times. In 2015, he tried out for American Ninja Warrior, cheered on by Seahawk teammates Derrick Coleman and Jermaine Kearse. His older sister Jill is the wife of the leader of the Conservative Party of Canada, Andrew Scheer. He and Colonna both appeared on Bar Rescue as one of the recon spies for Black Light District Rock & Roll Lounge. ^ "Jon Ryan and Devin Hester have come full circle". Regina Leader-Post. January 5, 2017. Retrieved February 1, 2018. ^ a b c "Jon Ryan". NFL Canada. Archived from the original on July 14, 2011. Retrieved July 5, 2010. ^ a b "2003 University of Regina Rams Awards" (PDF). University of Regina Rams. Archived from the original (pdf) on July 15, 2011. Retrieved July 5, 2010. ^ "University of Regina Rams lead CIS with five selected in CFL draft". University of Regina Rams. Archived from the original on July 15, 2011. Retrieved July 5, 2010. ^ "CFL.ca Statistics". Canadian Football League. Retrieved July 5, 2010. ^ "Jon Ryan Statistics on JustSportsStats.com". Just Sports Stats. Retrieved February 1, 2018. ^ "Packers sign seven reserve/future free agents". Packers.com. February 7, 2006. Retrieved October 7, 2016. ^ a b c d "Jon Ryan". Spotrac.com. Retrieved March 1, 2019. ^ "Jon Ryan 2006 Game Log". Pro-Football-Reference.com. Retrieved February 1, 2018. ^ Eric Goska "Eric Goska column: Jones making history, too", October 1, 2007. Accessed October 1, 2007. ^ Mike Vandermause "Mike Vandermause's Rants & Raves", October 1, 2007. Accessed October 1, 2007. ^ "Green Bay Packers at Minnesota Vikings - September 30th, 2007". Pro-Football-Reference.com. Retrieved February 1, 2018. ^ "Green Bay Packers at Chicago Bears - December 23rd, 2007". Pro-Football-Reference.com. Retrieved February 1, 2018. ^ "Detroit Lions at Green Bay Packers - December 30th, 2007". Pro-Football-Reference.com. Retrieved February 1, 2018. ^ "NFL Longest Punt Single-Season Leaders - Pro-Football-Reference.com". Pro-Football-Reference.com. ^ "Green Bay rolls over Detroit". NFL.com. Retrieved December 30, 2007. ^ "Ryan has gratifying afternoon". Wisconsin State Journal. Archived from the original on July 7, 2009. Retrieved January 1, 2008. ^ "Jon Ryan 2007 Game Log". Pro-Football-Reference.com. Retrieved February 1, 2018. ^ "2007 NFL Kicking & Punting". Pro-Football-Reference.com. Retrieved February 1, 2018. ^ "Camp helped DeBauche kick away woes". JS Online. Archived from the original on May 3, 2008. Retrieved May 2, 2008. ^ "Green Bay Packers Single-Season Kicking & Punting Leaders". Pro-Football-Reference.com. Retrieved February 1, 2018. ^ "Packers announce additional roster moves". Packers.com. September 1, 2008. Retrieved October 7, 2016. ^ "Seattle Seahawks at San Francisco 49ers - October 26th, 2008". Pro-Football-Reference.com. Retrieved February 1, 2018. ^ "Jon Ryan 2008 Game Log". Pro-Football-Reference.com. Retrieved February 1, 2018. ^ "Arizona Cardinals at Seattle Seahawks - October 18th, 2009". Pro-Football-Reference.com. Retrieved February 1, 2018. ^ "Jon Ryan 2009 Game Log". Pro-Football-Reference.com. Retrieved February 1, 2018. ^ "Seattle Seahawks at Chicago Bears - October 17th, 2010". Pro-Football-Reference.com. Retrieved February 1, 2018. ^ "St. Louis Rams at Seattle Seahawks - January 2nd, 2011". Pro-Football-Reference.com. Retrieved February 1, 2018. ^ "2010 Seattle Seahawks Statistics & Players". Pro-Football-Reference.com. Retrieved February 1, 2018. ^ "Jon Ryan 2010 Game Log". Pro-Football-Reference.com. Retrieved February 1, 2018. ^ "Jon Ryan 2011 Game Log". Pro-Football-Reference.com. Retrieved February 1, 2018. ^ "Jon Ryan 2012 Game Log". Pro-Football-Reference.com. Retrieved February 1, 2018. ^ "Jon Ryan 2013 Game Log". Pro-Football-Reference.com. Retrieved February 1, 2018. ^ "CBC Saskatchewan: 2014 the top sports stories". CBC News. December 31, 2014. Retrieved January 15, 2015. ^ "Super Bowl XLVIII - Seattle Seahawks vs. Denver Broncos - February 2nd, 2014". Pro-Football-Reference.com. Retrieved February 1, 2018. ^ "Jon Ryan 2014 Game Log". Pro-Football-Reference.com. Retrieved February 1, 2018. 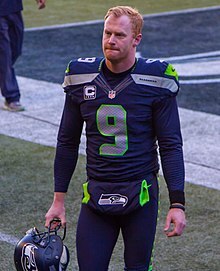 ^ "Seahawks' punter Jon Ryan is likely the first CIS player to throw an NFL playoff touchdown". ^ "NFC Championship - Green Bay Packers at Seattle Seahawks - January 18th, 2015". Pro-Football-Reference.com. Retrieved February 1, 2018. ^ "Super Bowl XLIX - Seattle Seahawks vs. New England Patriots - February 1st, 2015". Pro-Football-Reference.com. Retrieved February 1, 2018. ^ "Jon Ryan 2015 Game Log". Pro-Football-Reference.com. Retrieved February 1, 2018. ^ "Los Angeles Rams at Seattle Seahawks - December 15th, 2016". Pro-Football-Reference.com. Retrieved February 1, 2018. ^ "Jon Ryan 2016 Game Log". Pro-Football-Reference.com. Retrieved February 1, 2018. ^ "Jon Ryan 2017 Game Log". Pro-Football-Reference.com. Retrieved February 1, 2018. ^ Boyle, John (August 20, 2018). "Seahawks Release Longtime Punter And Franchise Icon Jon Ryan". Seahawks.com. ^ "Jon Ryan criticizes American Airlines following rough weekend". Seattle Seahawks. Retrieved March 1, 2019. ^ "A beloved punter walks into a bar: How Jon Ryan spent the day of his Seahawks release". The Seattle Times. August 20, 2018. Retrieved March 1, 2019. ^ Patra, Kevin (August 21, 2018). "Bills sign Jon Ryan after his release from Seahawks". NFL.com. ^ "Bills make these moves to reach the 53-man roster limit". BuffaloBills.com. September 1, 2018. ^ "Chelsea Lately Regular Sarah Colonna on Her [Canadian] Super Bowl Boyfriend and Survival in Show Biz | The Province". June 9, 2014. Retrieved March 1, 2019. ^ Vieira, Paul (January 31, 2014). "Canada's Speaker Has Stake in Seahawks Super Bowl Victory". The Wall Street Journal. Retrieved July 8, 2016.